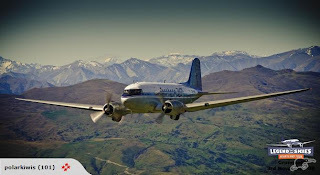 Awesome scenic flight in a Classic Aircraft. Departs Christchurch Airport overflying Christchurch City - Lyttelton Harbour - Sumner Beach - New Brighton Beach - Waimakiriri River Mouth - Christchurch Airport. Plenty of opportunities to visit the flight-deck and take photos. $120 Adult, $ 60 Child 12 years and under. 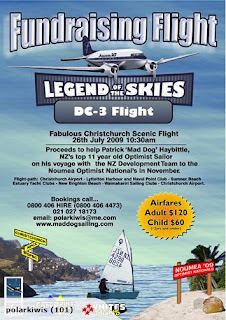 Proceeds to help our son Patrick 'Mad Dog' Haybittle, NZ's top 11 year old Optimist Sailor on his voyage with the NZ Development Team to the Noumea Optimist Nationals in November. Plenty of opportunities to visit the flight-deck and take photos. The aircraft has modern seating and "viewmaster" windows, and the scenery is astonishing. 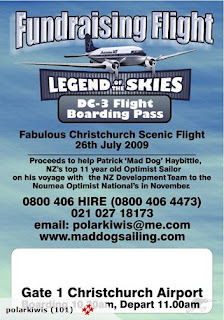 The flight takes you over the partly submerged giant volcanic cone of Banks Peninsula, around over the Pacific Ocean and over the Canterbury plains in full view of the snow clad Southern Alps ( the aircraft has a heated cabin) The Waimakariri is one of the best examples of a braided shingle river anywhere in the world and its full beauty cannot be seen from ground level.